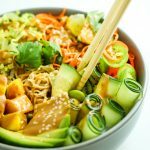 This summer roll bowl recipe is made with fresh, clean ingredients and topped with an irresistible spicy peanut sauce. Does life just get increasingly busier forever and ever until we die? Is that morbid? IDK. All I know is that we’ve been way too busy lately. And in 2 days, we’re getting on a plane bound for Mexico and I’m not going to think about anything for the following 8 days. The recipes are scheduled. The social media is scheduled. And I am checking out. A. DI. OS. 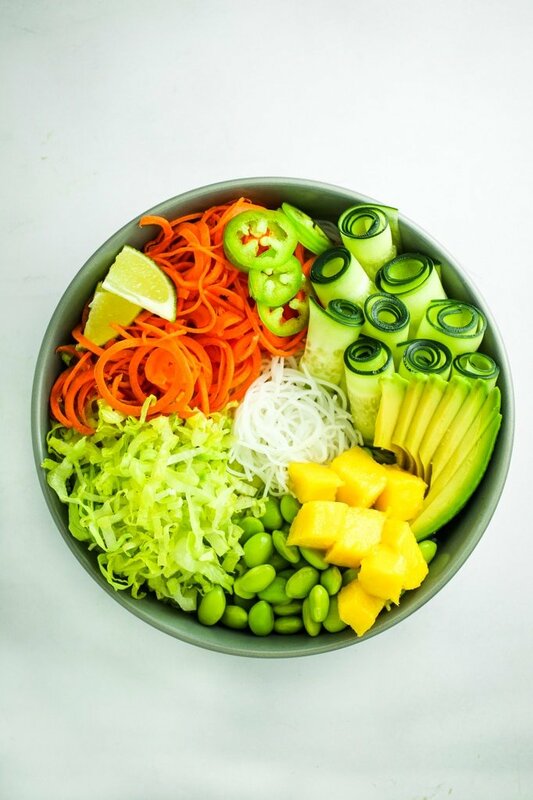 So let’s get right to the point because these summer roll bowls are the very last item on my to-do list and I’m stoked to share them with you guys. This is one of those recipes that I absolutely LOVE. 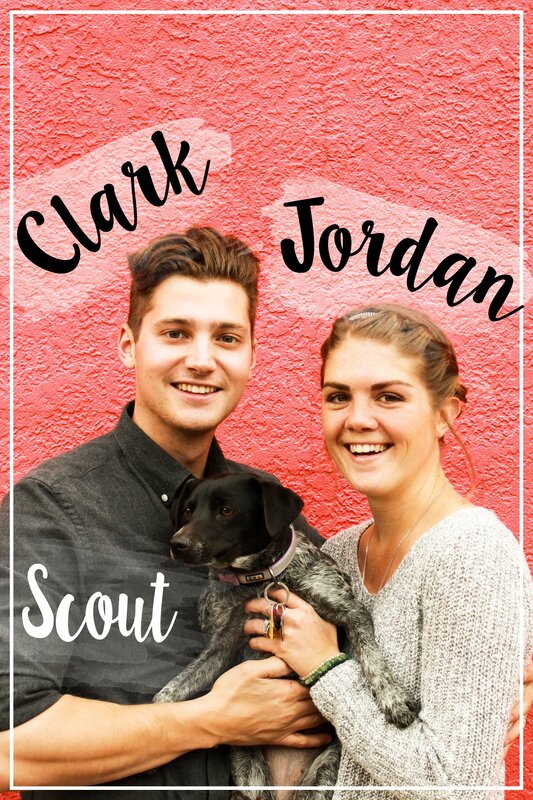 I really, really like all of the recipes that we share, but every once in a while a favorite like this comes along. And these summer roll bowls are that. The peanut sauce that goes along with them? It’s next level, y’all. I don’t know about you, but this is the kind of food I’m craving this time of year. Fresh, uncooked, preferably from the garden, and so simple. And that’s exactly what this dish is. It’s also more of a concept than a strict “must-follow-the-directions” recipe. It’s a “whatever-you-have-in-the-fridge” type of thing. Which, in my opinion, is the best kind of summer recipe. 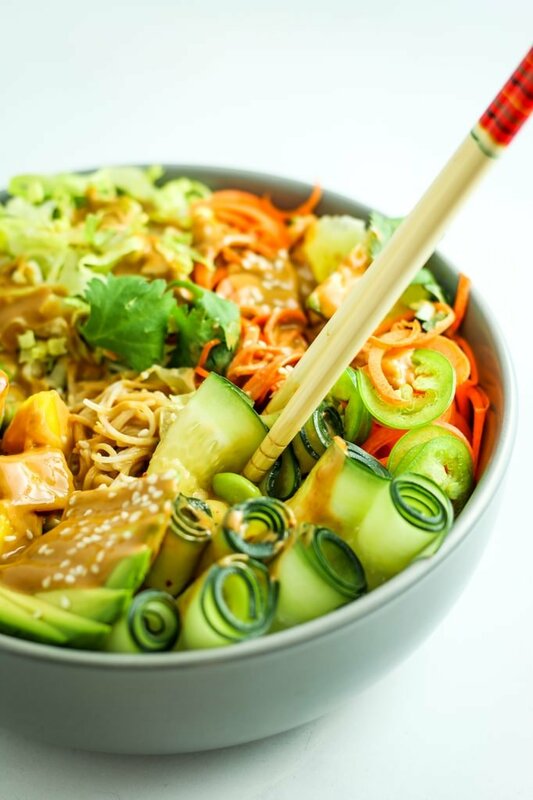 For our summer roll bowls, we combined a handful of veggie (and fruit!) textures, shapes, colors, and flavors. Which resulted in a vibrant, festive mouth party that’s also easy on the eyes.  BUT – if you’re not a fan of cucumber, substitute zucchini. Or if you don’t like edamame, swap in snap peas. That’s the fun with recipes like this one. They’re easily customizable, versatile for any season, AND I get to see what kind of modifications you guys do to make the dish your own. What I’m saying is, make yourself one of these summer roll bowls and then go eat it outside if at all possible. Maybe with some ice cold lemonade. Maybe with a glass of white wine. And snap a picture to share with me on Instagram, k? K.
Combine ingredients for sauce in a mason jar and shake until well combined. Set aside. Create your bowls! Shape the veggies and fruit however you like, with as much of each as you like. 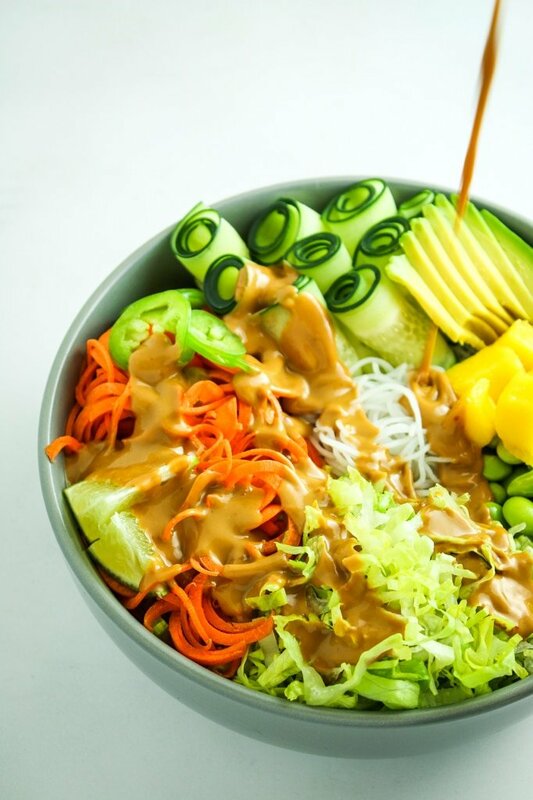 Drizzle the peanut sauce over top and enjoy! This recipe is 100% customizable to your tastes. Add a little more or this or switch something out for another ingredient. It’s loosely structured so you can have fun with it! I’ve been looking for more meatless lunch ideas and this one is fabulous! We’re big Asian food fans in our home and I always have all of these ingredients on hand except for the edamame – need to pick some up! Yes, girl! I think I need to go put mango on a salad bowl ASAP. And that peanut sauce? OH YA. This looks so fresh and delicious! Mango was totally a last minute addition but it takes these bowls to the next level! You’re gonna love them!